Redacted Mueller Report Coming Out Within 1 Week, AG Barr Tells Congress The attorney general says work is going well in redacting the special counsel's report about the Russian interference in the 2016 election — and DOJ has at least one other report coming too. Attorney General William Barr arrives to testify about the Justice Department's FY 2020 budget request before a subcommittee of the House Appropriations Committee on Tuesday. "I'm glad to talk to Chairman [Jerry] Nadler and Chairman [Lindsey] Graham as to whether they feel they need more information and if there's a way we can accommodate that," Barr said. House Judiciary Committee Chairman Nadler, D-N.Y., has been unequivocal in his calls for access to the full work product from Mueller's office — not only his report but the testimony, intelligence and other material that supported his findings. The chairman responded to Barr's comments on Tuesday in a post on Twitter that appeared to hold the view that no negotiations are required: The law grants Congress access to the material that Nadler has requested, he argues, irrespective of the views of the attorney general. In a subsequent post, Nadler said that no discussions of any kind are now underway: "We still have not heard from the attorney general." The attorney general also announced something else likely to please Graham: a forthcoming report about investigators' use of the Foreign Intelligence Surveillance Act in the Russia investigation. Graham has joined other Republicans in calling for answers about how authorities used material from former British intelligence officer Christopher Steele, author of the infamous Russia dossier, in the request for surveillance of Carter Page, a onetime junior Trump 2016 campaign aide. The attorney general also said the door appears open to more investigations or reports about the conduct of the Russia investigation — music to the ears of Republicans who have followed the lead of President Trump in calling it a "witch hunt" or suggesting it is the product of a conspiracy by the FBI and the Justice Department. "More generally I am reviewing the conduct of the investigation, trying to get my arms around all the aspects of the counterintelligence investigation that was conducted during the summer of 2016," Barr said. The Democratic majority on the House Judiciary Committee has voted to authorize Nadler to issue a subpoena for Mueller's work product and evidence if necessary. Barr told lawmakers later in the hearing that he isn't planning to give an unredacted copy of the Mueller report to Congress absent the negotiations he said he would be open to undertaking with Nadler. In other words, Nadler won't get a copy without at least asking and, perhaps, a separate dispute. If Nadler tries to use his power to issue a subpoena, that could lead to a court case. Barr also wrote that Mueller's office neither fully implicated nor exonerated Trump on the question of obstruction of justice; Barr and Deputy Attorney General Rod Rosenstein decided Mueller's findings were "not sufficient" for charges, Barr wrote. The attorney general said on Tuesday that although he is preparing for Congress and Americans to read what they can of Mueller's full report, the conclusions of which they are already aware are clearly important. "From a prosecutor's standpoint, the bottom line is binary, which is: charges or no charges," Barr said. Trump welcomed that conclusion and has claimed full vindication by Mueller. Graham and others took the opportunity to go on offense for themselves by amplifying calls for inquiries into the conduct of the investigation itself. 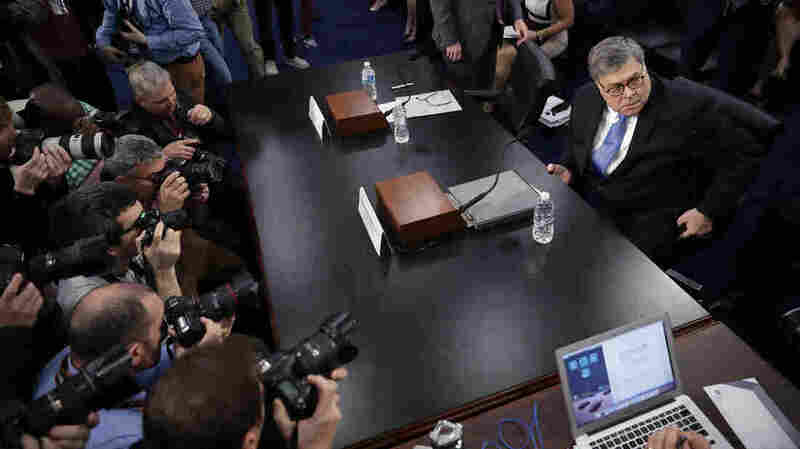 — those that would violate the privacy of people Barr called peripheral players to the main story.